MotU Minis Series 4 stays with the "A" team, giving us perhaps the second most important hero in the series. 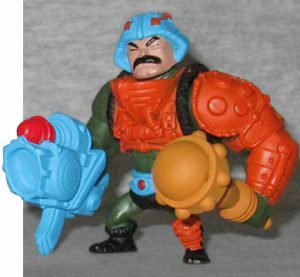 Man-At-Arms is Adam's mentor, Teela's (adoptive) father, Randor's main advisor... he's so integral, not even the movie could leave him out, and that thing gutted everybody! Sadly, these toys are based on the '80s incarnations, not the superior 2K2 designs, so beneath his yellow armor, his body is just a green leotard, not a cool mechanical suit. The detail on what armor he does have is surprisingly intricate for the size, and they didn't go "full toy" by ignoring his mustache. He comes with two accessories: his mace, which is expected, but then also his blue arm-gun, a 2002 creation! Hey, nice! Shame it only fits on his right arm, not the left where it belongs. On the plus side, the clip comes down low enough to touch the ground and help him stand securely. Duncan's enemy never appeared on the cartoon, and yet he's one of the most famous characters. How? He's Faker, the evil blue robotic warrior of Skeletor! 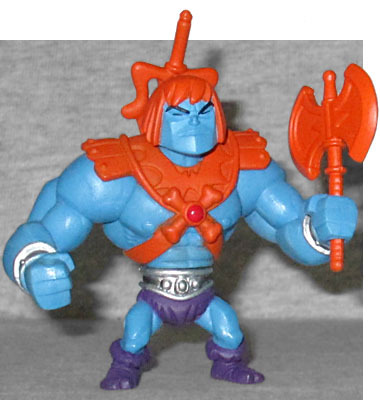 Since Faker has always just been "Skeletor's armor on He-Man's body," this really lends credence to the notion that Mattel was planning non-armored versions of He-Man and Skeletor. If they hadn't started with the oversized figures, we'd say this was just a repaint, but as-is, only his arms and legs are reused. His skin is blue, with purple fur, silver bracelets and belt, and orange Skeletor armor. He shares He-Man's silly haircut, but his mouth is closed, which is how we can tell it's a new mold. His armor has a loop in the back to hold his copy of the Power Sword, and he's also armed with a double-bladed axe. Both weapons are the same flat orange as his chest plate. Man-At-Arms and Faker might have sold on their own, but they didn't have to: buy all six MotU Minis sets, and you'll be able to build your own miniaturized Castle Grayskull. Set #4 includes a pretty integral piece, the jawbridge. Big green brick wall with a big wooden door in the middle. You get the idea. Duncan would obviously be better with more of a Mo2K influence, and it's a shame there was no way to give Faker his robotic chest panel, but overall this is a pretty swanky pair of minis. The only thing these really did for me was make me a bit more excited for MOTU Imaginext or Mega Bloks. Any eventual retail debut of some sort of smaller-scaled MOTU. These were just expensive MOTU Skips Leg Day sets. If MOTU Imaginext sets existed, I would have spent SO MUCH MONEY on them! That would be pretty great -- that might finally sell me on the Imaginext brand. In an ideal world I'd love to see Lego do an MotU range too, but it's probably not very likely. Faker's that minor character that seems more important because he's such a lazy dumb creation and was an early release. One episode in Filmation's series, not looking like the toy. One mini-comic appearance for his reissue near the end of the vintage line. No 200x appearance...sort of a cameo. Surprised MOTU classics didn't milk the concept. Faker-Teela, Faker-Man-At-Arms (instead they did Snake-Man-At-Arms).